To conventionally breed a new crop variety, two closely related plants are ‘sexually crossed’. The aim is to combine the favourable traits from both parent plants and exclude their unwanted traits in a singular new and better plant variety. Breeders cannot say for sure if the genes that convey the desired traits are present in the parents or their progeny (offspring), and in most cases, either a very small proportion − or none – of the progeny will have the desirable traits. Other impediments are the time it takes to grow the progeny, the number of progeny needed to be developed and grown (thousands) and the objectiveness of visually identifying the traits – a process referred to as ‘phenotyping’. 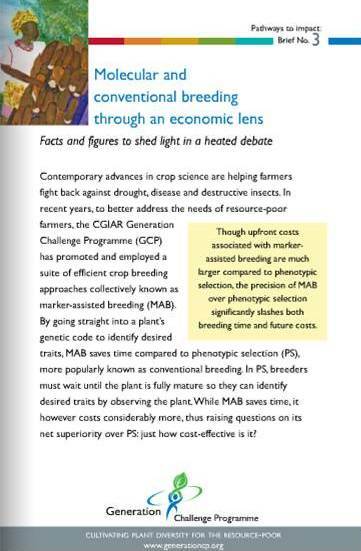 Marker-assisted breeding is a lot more specific. It still requires breeders to sexually cross plants, but they can subsequently confirm they have bred the desired trait into the target plant without necessarily phenotyping under conditions that would express the trait. Being able to do this at the seedling stage reduces the time required and need to continue to grow unwanted progeny. Breeders will then grow key progeny and phenotype them when they are fully grown to check that the genes are functioning within the particular environment and in a desired genotype.